The contents of our Website/Websites are owned by or licenced to us and are operated by Drainage Experts Ltd and protected by copyright. The includes, but is not limited to, the design, layout, look, appearance and graphics. Reproduction of part or all of the Website is prohibited other than in accordance with this Notice. By using, visiting this Website you the user accept to comply with and be bound by our terms and conditions in full. If you do not agree to these terms in full you are not permitted to use the website and must leave the site immediately. 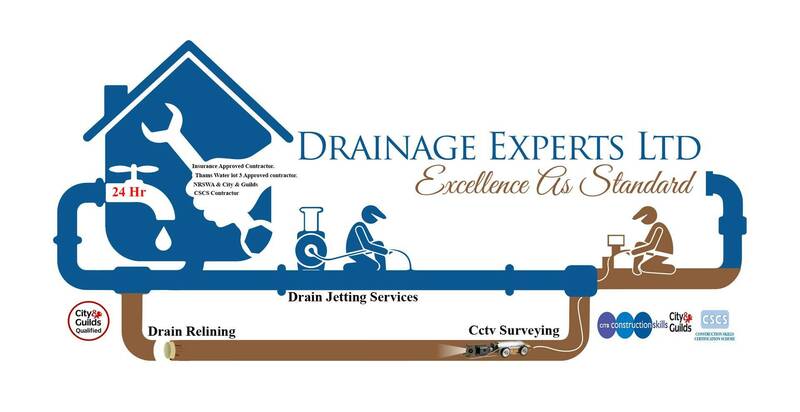 The term Drainage Experts Ltd or DEL or “us” or “we” refers to the owner of the website. The term “you” refers to the user or viewer of our website. By entering our website / or using our services you agree to all Drainage Experts Ltd T&C as set out on this page. You should satisfy yourself that your private or company systems and resources work as expected to use our Website & browse its content, Drainage Experts ltd are not responsible for any technical or other issues that may arise if you download software or upgrade your browser software to enhance your usage of our Website/Websites. You must not deliberately distribute software viruses (or other such harmful software), unsolicited email, nor gain (or attempt to gain) unauthorised access into any part of this website by any means. You acknowledge that the information and material contained on our website may not be error free and may contain defects and we expressly exclude our liability for any such inaccuracies or errors to the fullest permitted by law. Neither we nor any third parties provide any warranty or guarantee as to the accuracy, timeliness, performance, completeness or suitability of the information and materials found or offered on this website for any particular purpose. You will rely on your own judgement to ensure that the information and material contained on the Website and any output from them are suited to your needs and purposes and meet your specific requirements. damage, interfere with or disrupt access to our Websites or do anything, which may interrupt or impair their functionality. From time to time this website may also include links to other websites. These links are provided for you so as to provide further information. They do not imply that DEL endorse the website(s). DEL have no responsibility for the content of the linked website(s). Your use of this website and any dispute arising out of such use of the website is subject to the laws of the United Kingdom. Unauthorized use of this website may give to a claim for damages and/or be a criminal offence. We will not in any circumstances be liable, whether in contract (by way of indemnity or otherwise), (including negligence and breach of statutory duty), restitution or otherwise for loss of profits, loss of contracts, loss of revenue, loss of data, loss of use of equipment or process, loss of anticipated earnings or savings, or wasted management time each one howsoever arising and whether or not we have been informed of the potential loss or damage arising and whether incurred directly, indirectly or consequentially by you or any third party. All rights and interests in all intellectual property in all materials and all concepts within or downloaded from the website or provided directly from Drainage Experts Ltd (including but not limited to its design, structure, narrative, graphics, expertise, software and its source code) will remain our property at all times. You gain no ownership of material and are solely licensed to use the Materials whilst these terms exist. All works carried out by us regarding drain relining must have annual maintenance to ensure compliance with our T&C this will consist of high pressure jetting & cctv surveying to ensure liner is in good general condition to ensure your guarantee is valid, non compliance of this makes all liability by us non & void and we accept no responsibility for any costs in repairing or replacing such materials or costs incurred by other contractors or home owner, any materials ordered are the full responsibility of the home owner and must be paid in full prior to any works taking place in the event of cancelled work for what ever reasons is the responsibility of the home owner, any protective covering put in place is the responsibility of the home owner if damage occurs to painted or non painted surfaces we can't be held responsible if we have not removed any covering put in place and while we will take every care in removing protective covering we can not be held responsible for any damage caused while removing coverings/adhesive tapes etc. Any repairs carried out by Drainage Experts Ltd carry a 12 month workmanship warranty unless stated otherwise any other warranties regarding manufacturers products are theirs and theirs alone and we do not accept any liability for defective products by manufacturers. We give all customers the option of various services & their costs this can be options regarding cctv surveying by way of an approved Wincan V8 reporting software or a hand written report you must satisfy yourself as to which you feel is suitable DEL accepts no responsibility for you decision. By accepting our work T&C you accept all liability for any or all works, as well as any outstanding payment over 14 days incurs a 15% charge by signing your invoice you agree to these terms. Any work undertaken by Drainage Experts Ltd for insurance companies or insurance management companies or private individuals/PLC or Ltd companies accept all liability for works carried out by us and agree to pay any payment due to us, by instructing our services you agree to these terms & conditions we also promise to ensure all work is carried out with the highest of standards and within a time frame that is reasonably achievable unless circumstances out of our control prevent us doing other wise, we can not be held responsible for circumstances beyond our control by approving us on your network of approved contractors you accept full liability.